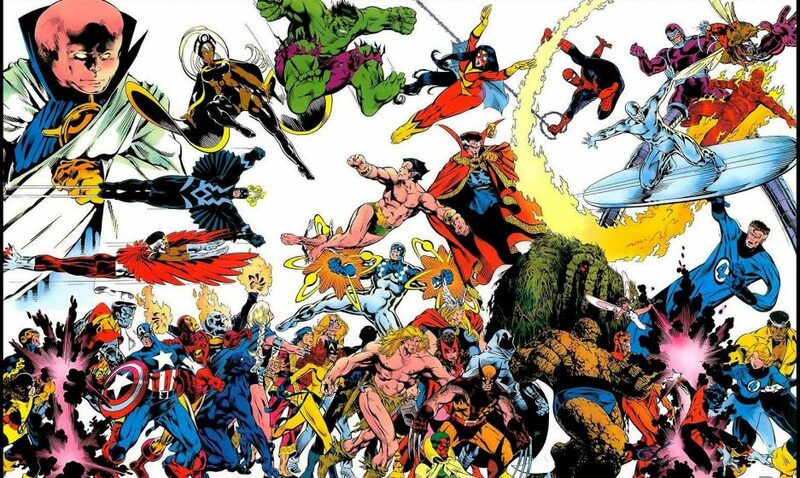 Synopsis: Hero worship was written and drawn by John Byrne, with inks by Al Gordon and opens with Jennifer ‘She-Hulk’ Walters telling her boyfriend Wyatt Wingfoot (remember him? 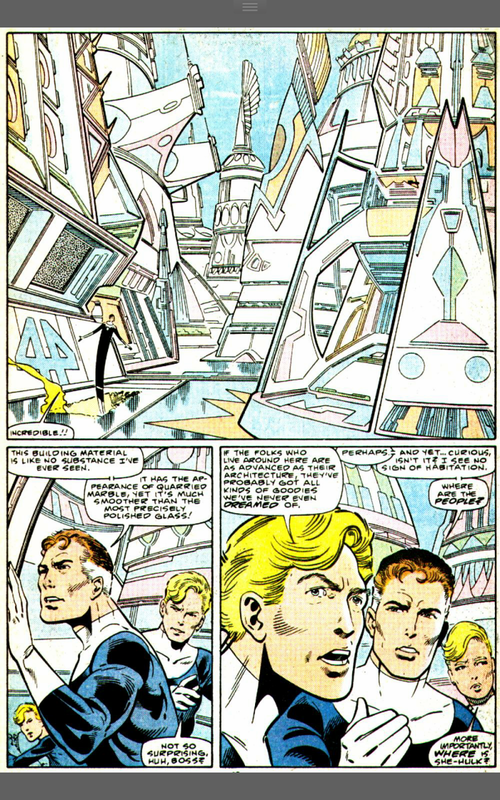 From the Lee/Kirby run) that Central City California is enclosed within an unknown black globe. 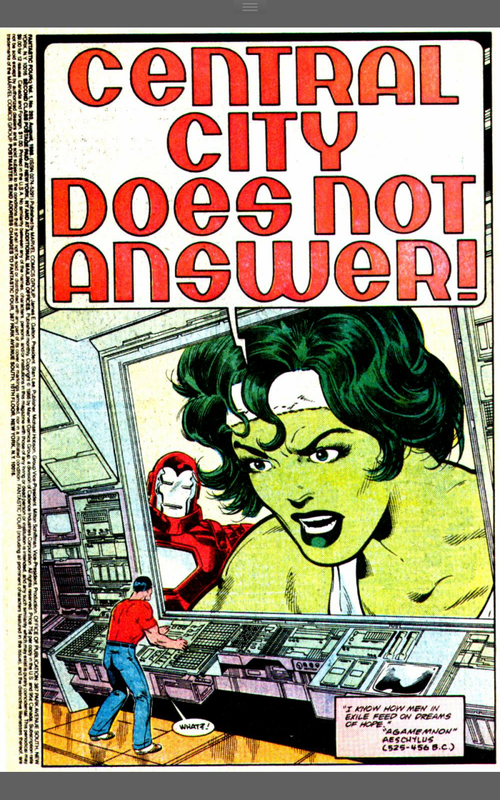 She Hulk is outside the city with Tony ‘Iron Man’ Stark, Simon ‘Wonder Man’ Williams and Greer ‘Tigra’ Nelson representing the West Coast Avengers, who are providing support as Jen tells this to Wyatt using the Avengers’ version of Skype. 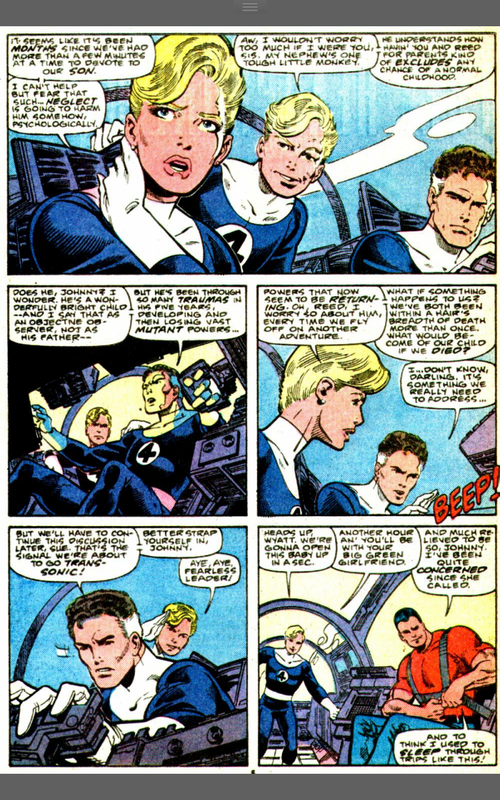 Wyatt rushes to tell the rest of Jen’s team-mates, Reed ‘Mr Fantastic’ Richards, Susan ‘Invisible Woman’ Richards and Johnny ‘the Human Torch’ Storm who are with friend of the family Alicia Masters. The four are looking at a boy called Kristoff, the young ward of Doctor Doom, who has had Doom’s memories grafted onto his, so he believes he is in fact Victor Von Doom. The group are discussing the harsh reality of these events when Wyatt runs in and drops the plot off. 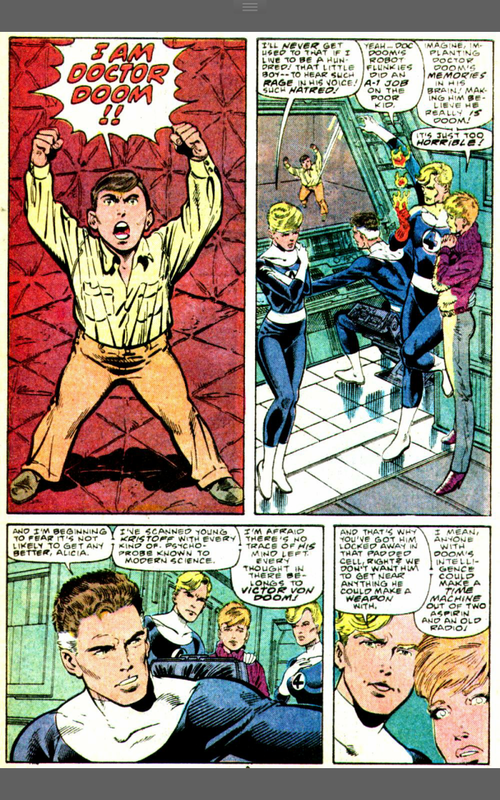 Very shortly afterwards the rest of the FF as well as Wyatt are flying over the country towards Central City while Sue stresses about the effect their lives of action, danger and adventure have on their young son Franklin. Also Johnny and Wyatt talk about Wyatt’s relationship with Jen. Speaking of Jen, she’s still with Iron Man who finds a technological way to get into the black sphere. A couple of seconds later, he falls out and everyone is shocked to learn that for Iron Man, that couple of seconds lasted 3 weeks and it has left him dehydrated and exhausted. 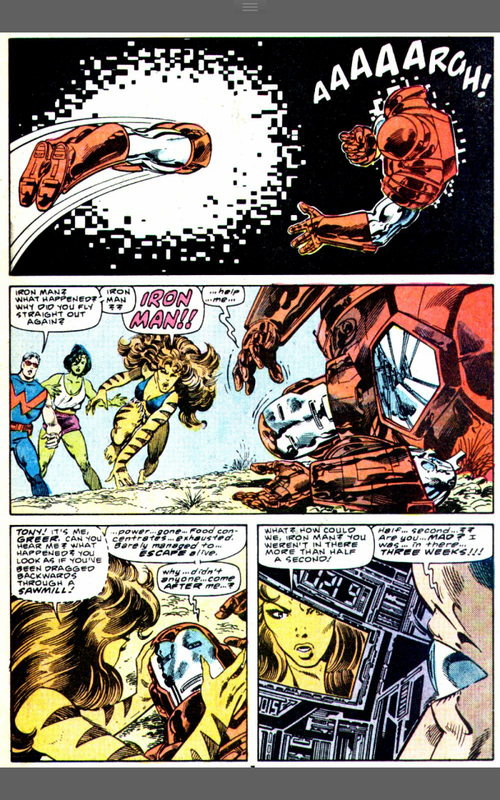 Wonder Man flies the collapsed Iron Man to the West Coast Avengers’ compound whilst She-Hulk and Tigra watch the sphere expand. She-Hulk gets her hand caught in the sphere and is pulled inside as the sphere expands. Tigra escapes and informs the arriving Fantastic Four (well the Fantastic Three plus Wyatt) what’s happened. 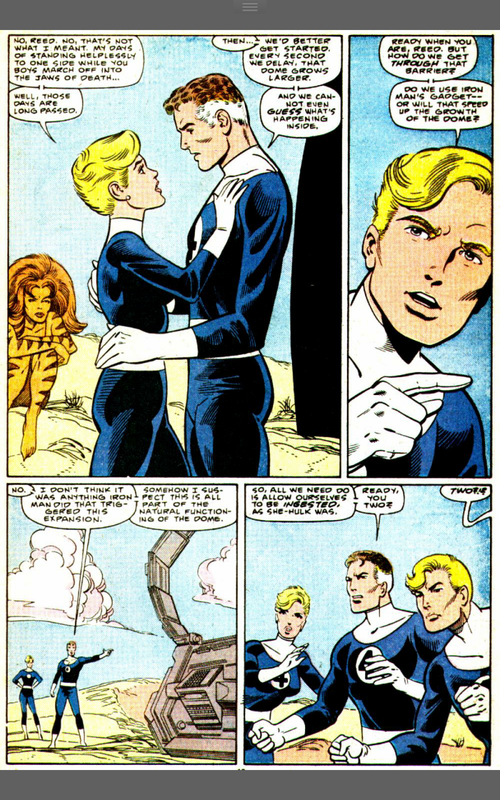 We get a “But what does it all mean Reed?” Fortunately it doesn’t come from Sue this time, then the team decides to go in after Jen, but of course tell Tigra to wait outside and again pass messages along. Always nice to treat an Avenger like WhatsApp in a bikini. As the dome envelopes the foursome, something we don’t get to see here starts happening to the dome. 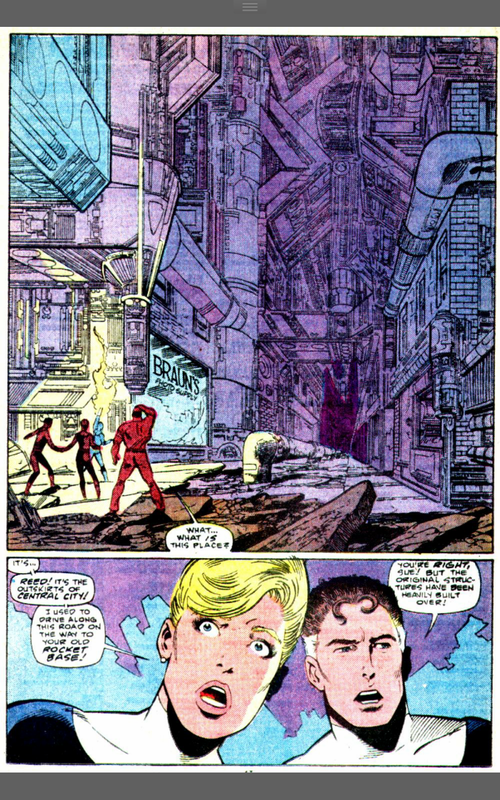 Sue, Reed, Johnny and Wyatt awake in the ruins of Central City as it was when Reed and Sue lived there. Sue and Johnny use their powers to get to a level built over the streets of the City and find a futuristic looking city full of marble buildings that are smooth and shiny. But it’s all curiously uninhabited. 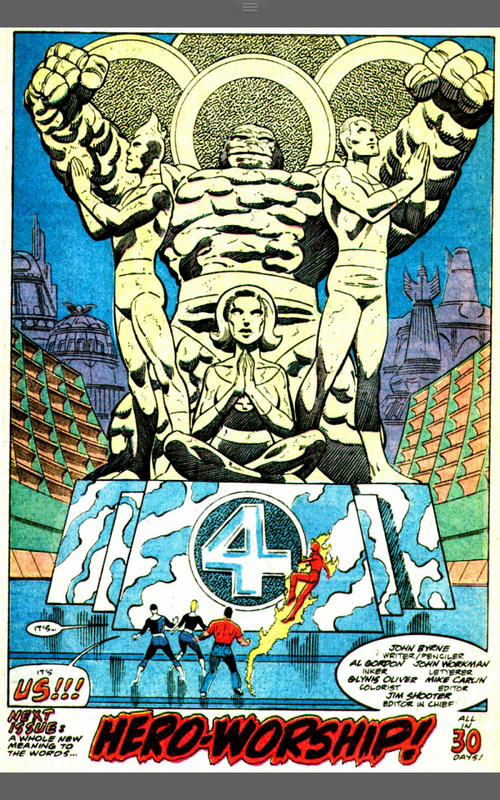 At the end of one road is a small-scale version of the old Baxter Building, then another and in between them is a large quasi-religious looking stature of the original line up of the Fantastic Four and no one has any idea why. Notes: Well I’m a long time Byrne victim,so I was thrilled when this little nugget came up on the docket. Byrne’s Fantastic Four run is one of the greats highlighting both his clean iconic superhero art with his simplified, but not simplistic characters. At this point he was very much at home with the Four, his Johnny is more mature and caring, but is still very much the annoying little brother of the team. Sue is still the mother figure, but is confident and self assured in her abilities. Reed is still as clueless as ever, but you can see his heart even when he’s being a bit smug with his brain. 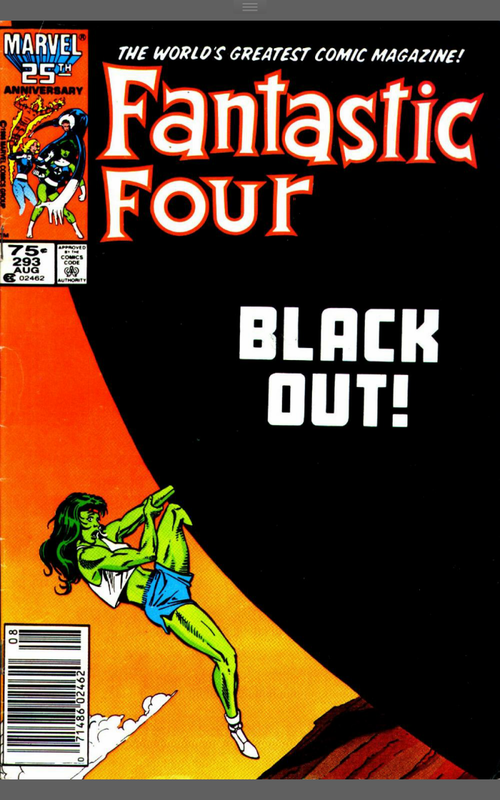 Despite my being a big fan of the ever lovin’ blue eyed Thing, the lack of the idol o’millions does leave room for She-Hulk to become her own little star of the book. 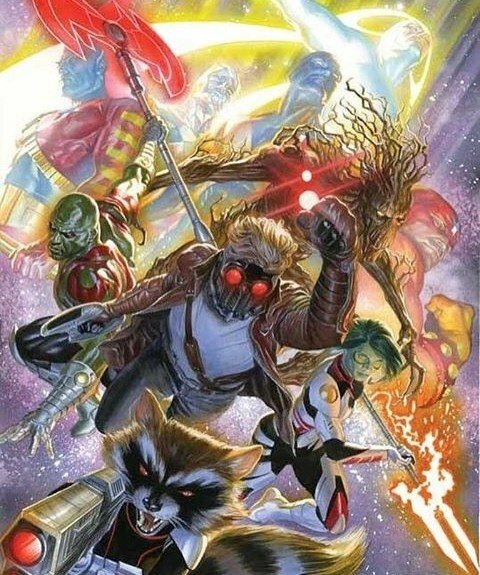 We also have the heir of Doom, the least respected Avenger and for reasons I forget Wyatt Wingfoot is once again a recurring character in this book. This is a packed issue, but thanks to Byrne’s pencils, it never feels particularly cluttered. While a lighter inker like Terry Austin or Karl Kesel are often a better fit for Byrne, Al Gordon does a decent job and we get an average looking Byrne era FF comic which is a damn not better than many other titles of the same vintage. The best thing about this comic was that it’s exactly what the FF should be, a family adventure about exploration and bonkers super-science. Where did the black sphere come from? Where are all the people of Central City? What is the deal with the statues? None of these questions are answered, but only serves to get me interested in the next issue. Overall a fantastic taste of this series during one of it’s many high points. Next Time: Sub-plots and Sub-par villains as the Sinister Six get’s a tribute act. ‹ PreviousApril 1986: Peter Parker the Spectacular Spider-Man 116 – Or, who exactly are we supposed to root for? Next ›June 1986 – Amazing Spider-Man 280 – Or, What? Were Kangaroo and the Spot busy?